Celebrate humanity's diverse expressions of power and divinity with these mystical symbols from around the world. These luxuriously scented Vanilla candles by Nirvana burn for a whopping 120 hours. 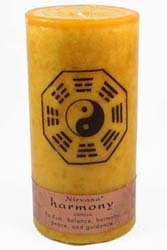 This candle is for balance, harmony, peace, & guidance. It has the ancient Chinese yin-yang symbol which represents all things being in balance.